The September 1995 raid on the Geneva Freeport premises of Giacomo Medici brought to light a major archive of some 4000 photographs. These images, some Polaroids, have been used by the Italian authorities to identify objects that have passed into public and private collections. By my estimate less than 1% of the items identified in the photographs have been returned to Italy. Other major sets of photographs have been seized from a Basel warehouse (approximately 10,000 images) and on the Greek island of Schinoussa. Research on this material will undoubtedly lead to further identifications. 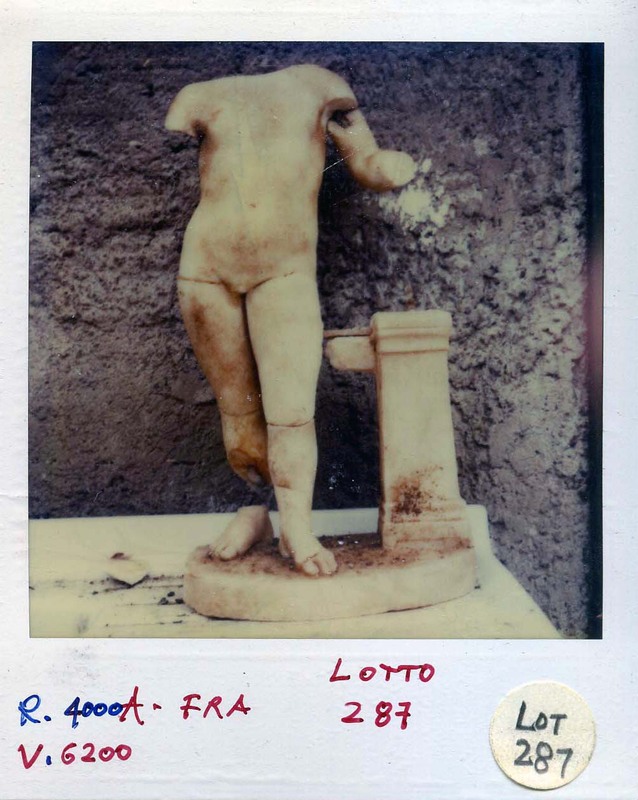 A related set of images show objects once handled by the Swiss-based conservator Fritz Bürki. Out of curiosity, why have the photographs not been released to the public, or even the Art Loss Register? Why not take a proactive approach as opposed to reactive each time one of the objects is set for auction? Is there fear that the objects will be driven "underground?" Whether or not that would happen is quite debatable. You are assuming that (some of) the photographs are not on the ALR. How hard would it be to compare photos of objects that come on sale to these photos using image-recognition software? "Find photos like this" would at least be one way of looking for matches. iPhoto can find lots of faces, and surely there are comparable things for objects. The auction houses would do this. Image recognition software is here - and similar to the feature you mention on iPhoto for faces. I hope that auction-houses are not ignoring identifications. We await a statement from the Art Loss Register. I have been in touch with two of their staff this week but you will have to be patient. The problem for police forces: stolen art teams are overall not very well funded, and can not always acquire the software or hardware they need. ALR will probably end up acquiring these technologies too. Disclaimer: I am the CEO of www.ltutech.com, and we make image recognition tech bricks (basically, the algorithms) to build such software.